Julie Manthey started writing stories for her family and friends as soon as she could hold on to a crayon. She is a novelist, traveler, screenwriter, and eternal optimist who always tries to leave room for hope. She is always planning her next trip and is taller in person. The Magic of Cape Disappointment is a contemporary fiction novel written by Julie Manthey. Kay Baker had escaped Cape Disappointment and the expectations that her family lineage had placed upon her. Yes, she was the great-great-great-granddaughter of Kehlok, the daughter of adventurer Meriwether Lewis and Tamahna, a local native medicine woman. Kay had gone to medical school as her mother had wished, even as she co-majored in art, her true love and passion, and she had finished med school before abandoning that professional goal and turning to art full-time. She loved living in Manhattan and was thrilled to have her own studio there. It was a far cry from the small town life of Ilwaco, Washington where she grew up. When she got a call informing her that her parents had both died in a car crash, however, she dropped everything and rushed home to be there. She would be the only support for her Gran, who was ninety-seven and apt to forget where she was in time, until her brother Lou came to help. Kay’s mom’s last request to her was that she would not put Gran in a nursing home, and Kay was determined to abide by that. Suddenly, New York and her life as she knew it was in the past, and she was back in Ilwaco. 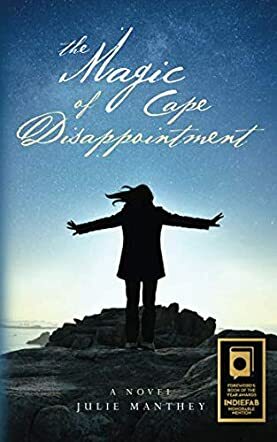 Julie Manthey’s contemporary fiction novel, The Magic of Cape Disappointment, is an intriguing and powerful blend of modern-day life, history and mysticism. I loved learning more about the Cascadia range and Cape Disappointment, and found the author’s treatment of the Clatsup history and legends to be fascinating. Manthey also addresses an issue of concern about elderly care, especially for those with Alzheimer’s or other dementia issues, and the resulting stresses that fall upon the relative who somehow finds themselves in the role of caretaker. I could feel for Kay as she loses everything she had built up for her own life’s goals, even as I loved the synchronicity that had her literally visualizing her future path while still in Manhattan. Manthey’s characters are marvelous; her story rocks on so many levels, and her writing is fluid and a joy to read. The Magic of Cape Disappointment is most highly recommended.